It looks like Shumdog's campaign is a millionaire. Extending his fundraising streak for yet another month, incumbent Gov. Peter Shumlin on Monday reported raising more than a million dollars total for his reelection campaign — $1,000,467.02, to be precise. For the third month in a row, Shumlin out-raised Republican opponent Randy Brock and spent less than the Franklin County state senator. 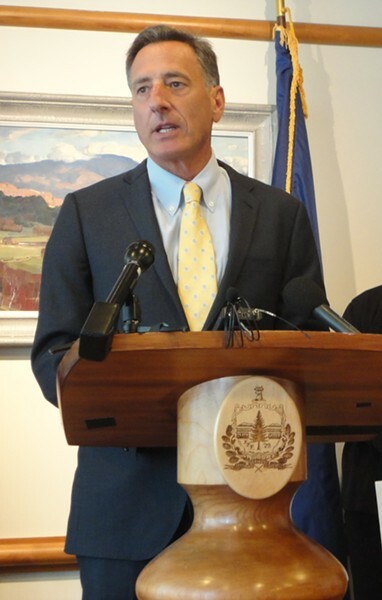 In the reporting period ending Friday, Shumlin brought in $161,000, compared with Brock's $62,000. The incumbent spent just $35,000, while his challenger spent nearly every dime he raised last month: $61,000. While Shumlin hit the million-dollar buzzer Monday, Brock's campaign total is just $647,000. That includes the $300,000 the challenger has loaned his own campaign. In terms of cash-on-hand, Shumlin has $893,000 available to spend, while Brock has just $239,000 in the bank. As he has throughout the campaign, Shumlin relied heavily on high-dollar contributions from special interest groups, unions and corporations. The governor took in $6000 from the AFL-CIO and $5000 from the American Federation of Teachers this past month, along with $5000 from the physician-assisted-suicide group Patient Choices of Vermont and $2000 from the marijuana legalization group NORML. Among the corporations backing the incumbent this month? Anheuser-Busch ($1000), Cassella Construction and Casella Waste Systems ($4000), Dish ($2000), Iberdrola Renewables ($1000), Marathon Resort Management ($2000), Rumford Falls Hydro ($2000), Subaru of New England ($2000), VISA ($2000), West Delaware Hydro ($2000) and many, many more. In the department of rich people giving lots of money, Shumlin received two $2000 checks from gazillionaire financier George Soros and from his wife, Andrea. Lt. Gov. Phil Scott, a Republican, out-raised Progressive and Democratic opponent Cassandra Gekas three-to-one last month — bringing in $37,000, compared with Gekas' $13,000. Throughout the campaign, Scott has raised $96,000, while Gekas has raised just $27,000. Scott's expenses include $15,750 to WCAX-TV and $3719 to WPTZ-TV (We don't own a TV, but we assume this means he's going up on-air?). Gekas' expenses include $151.47 to Ann Taylor Loft for "campaign/candidate supplies" (We assume that means the kind of supplies you can wear.). Jack McMullen, the Republican candidate for attorney general, raised slightly more than incumbent AG Bill Sorrell last month, even though the reporting period includes the tail end of Sorrell's heated primary contest with fellow Democrat T.J. Donovan. McMullen took in $15,000 — the vast majority of which came from donors who live outside Vermont — while Sorrell raised $14,000. They each have roughly the same amount of cash left to spend ($12,000 for McMullen and $11,000 for Sorrell). Though McMullen has personally bankrolled previous statewide campaigns, he has loaned himself just $8486 so far this cycle. After falling behind Republican challenger Wendy Wilton in monthly fundraising last period, incumbent state treasurer Beth Pearce picked up the pace this time around — big time. She raised $37,000 this month, compared with Wilton's $16,000. That brings Pearce's campaign-to-date haul to $133,000 (she's spent $68,000 of it), while Wilton has raised $50,000 total (she's spent $31,000 of that). In the race to replace Tom Salmon as state auditor, Republican Vince Illuzzi raised $12,000 last month, while Democrat and Progressive Doug Hoffer raised $6000. In total, Illuzzi has brought in $64,000 this campaign — though that includes a $25,000 personal loan — while Hoffer has raised $33,000. The biggest news of the day, of course, was the revelation that the money behind Vermont's new conservative Super PAC came from Burlington resident Lenore Broughton. You can read our story about Broughton's $100,000 contribution to Vermonters First here. You can also take a look at our posts on the July fundraising reports here and the August reports here. We'll have much more in this week's Fair Game.